It is Bitten By The Bug 2 Design Team Monday. This week Melissa got to choose our challenge. She picked the Dachshund on the Paisley Cricut Cartridge. This was a fun one. I remember wanting Paisley so bad when it was announced, getting it right away, but sadly I cannot remember if I ever actually have used it. Well, now I can say YES I have! Please make sure you go on over to Bitten By The Bug 2 to see all the other creative ways my fellow Design Team has used this cute little dog :) Then make sure you play along in the challenge and make a creation of your own. No fancy techniques here....just great Cricut cuts, some trimmer cuts and a Martha Stewart punch. 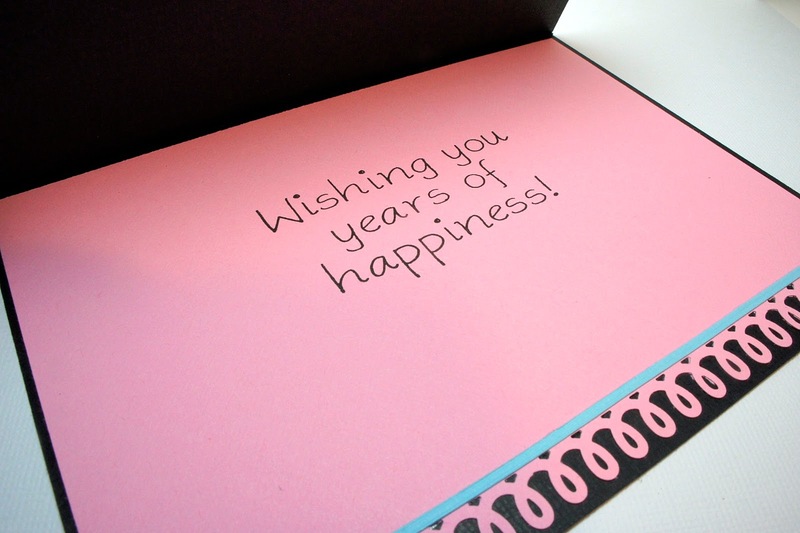 A little something different...I actually finished the inside of the card, LOL! And do the colors look familiar?? It was all made from scraps from my card set projects with Florals Embellished. 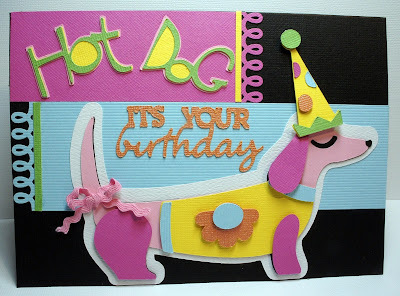 Paisley = Dog @ 3.0"
Birthday Bash = Party Hat @ 1.94" and It's Your Birthday @ 2.29"
Paper Pups = Hot Dog @ 1.12"
Coming tomorrow.....our monthly My Pink Stamper Design Team post! Cute card Maria, I love the colors together. This would be a card my sister would like. (Now I just have to get the cartridge!!!) TFS. Have a Wonderful crafty day! Cute card!! I love the bright, spring colors against the black background!! Maria, this is one cute cute doxie. So colorful, and havin' a good time, I can see. Love it. Oh this is gorgeous Maria! The sorbet colours really pop against the black. Love the design and great use of so many carts! 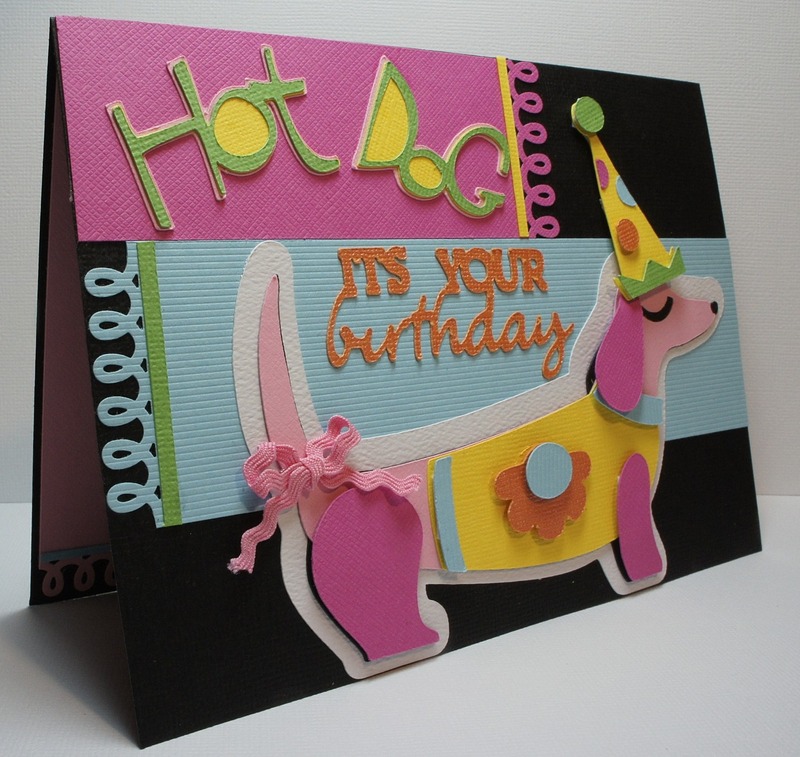 What a fun, bright and cheery B-Day card this is, so Fun! Love all the Bright colors on the black background makes everything POP! And I had to giggle, I have a hard time getting the inside done too, lol! Love your party pup, Maria. That hat is just too cute. This is just too cute. You really did a good job. I thought initially that it was a lot of work, but you made it seem so easy. What a great card. Brilliant colors and the loops give it an extra fun playful look. This is an image I probably would never have thought to use, but you have totally inspired me! This is sooo cute! 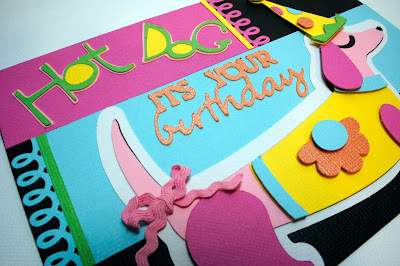 I love how you made the border loop punch in two different colors...all on one card!! maria, how beautiful! i was just telling donna i bought this cart for the doxie and i haven't make one yet. (i had two long hair doxies at the time). i just love the card, and the color are fab too. Loving this party pooch, Maria. What a great card! You have been a busy woman! LOVE the design of this!! I really like the loops. I see you couldn't get away without making a hot pink dog like the example, too. LOL! I loved the idea of a pink dog. This is so sharp and clean!